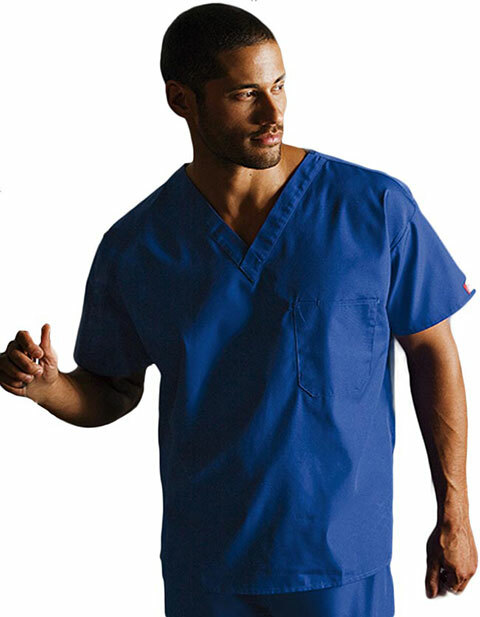 Getting a high-quality scrub top will make you feel and look good while you fulfill your tasks as a healthcare professional. This unisex v-neck scrub top from Dickies has a comfortable fabric composed of polyester and cotton poplin. A chest pocket is provided for storage of essential things you need at work. It is added with a Dickies logo on the left sleeve, while short set-in sleeves and side vents are added for easy movement. Center back length is 28 inches. My husband's present to me on our anniversary was exactly the same as this hot pink unisex v-neck scrub top paired with same color unisex scrub pants. I so love it that I really bullied my husband to tell where he got the pair and how much it really cost. Fortunately, he conceded and gave me this site. I am going to buy more in the next few days. Me and my girlfriend are both nurses and we even work at the same institution. My girlfriend decided to get this unisex nurse scrub top from Dickies uniforms as couples scrub thing. Our colleagues find it really sweet. I just want to let everyone know how outstanding Pulseuniform is. I purchased this solid scrub top as my workwear and when I received my package my husband also liked the scrub top that he also ordered one for himself. well hes not a medical professional. He just finds the scrub so comfy that he wants to use it at home. We both had a good laugh because of that.